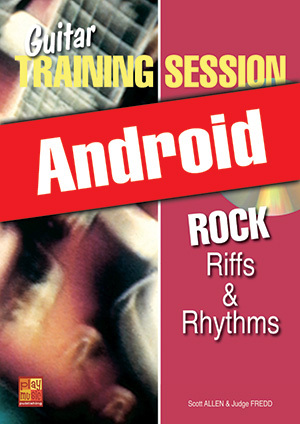 Guitar Training Session - Rock Riffs & Rhythms (Android) (GUITAR, Courses for Android, S. Allen & J. Fredd). By offering you the possibility to evolve in actual group situations, this coursebook not only teaches you how to perform, but also how to spice up your rock accompaniments. The enclosed CD contains 19 complete backing tracks (drums, bass & guitar) on which you can play the numerous rock riffs and rhythm parts proposed in this coursebook contextually appropriately. In doing so, some of you will simply discover the pleasure of playing superb rock accompaniments, while others will use the interpretational ideas presented in this coursebook to further their personal style and create their own rhythm parts. Practicing your instrument is therefore as personal as your own playing because the choice is yours! The songs in this coursebook feature varying difficulties and cover diverse rock directions, such as Classic Rock, Pop-Rock, Southern Rock, Slow Rock, Blues Rock... Armed with this level of knowledge, you are fully prepared to meet all foreseeable future challenges. Since you are dealing here with the Android version of the tutorial, the book and the CD have been replaced by a tablet-optimized multimedia pack containing musical sheets, texts and audios.